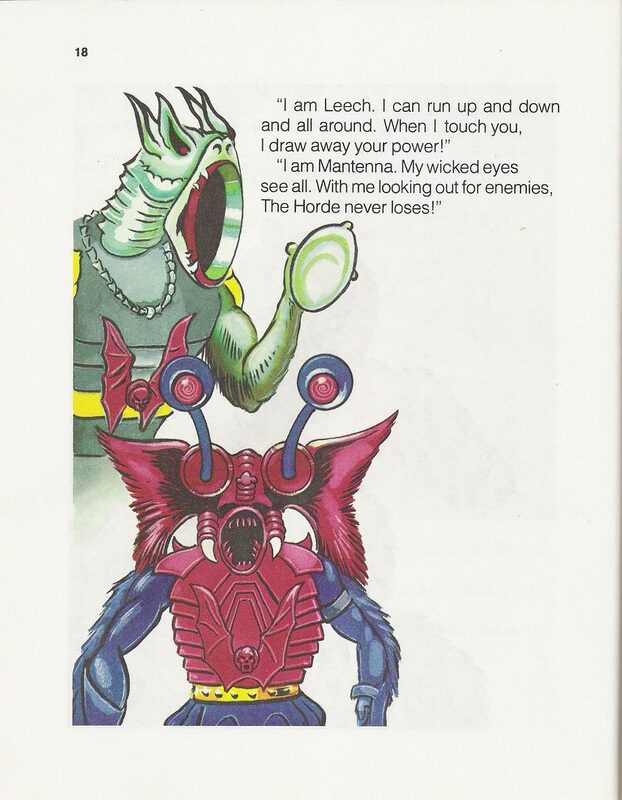 I got Mantenna at the same time I got Leech, for Christmas in 1985. While I gravitated toward Leech at first, I kept coming back to Mantenna. 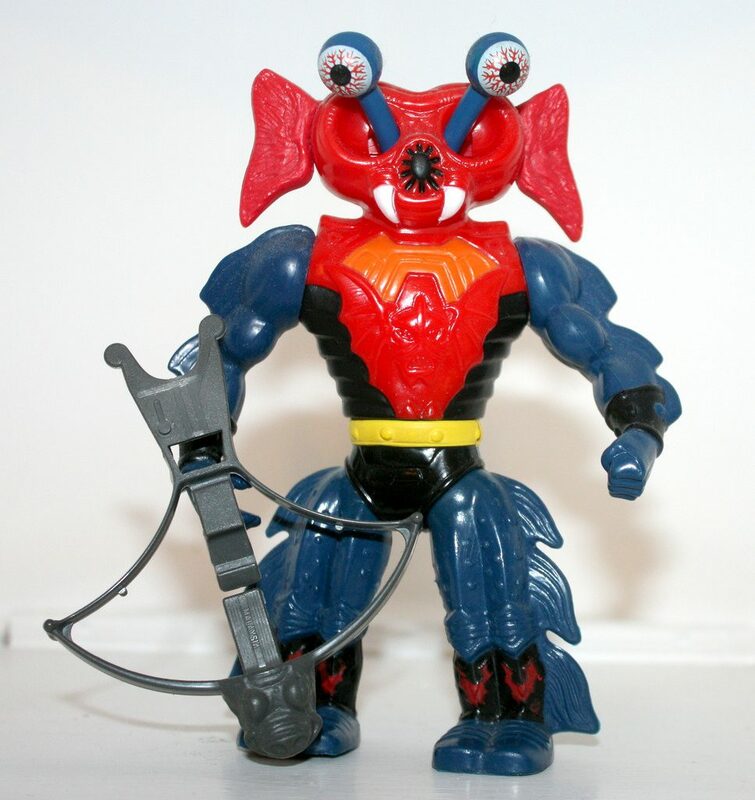 His telescoping eyeball action feature wasn’t all that much fun, but his bizarre appearance kept drawing me back in. What was this guy? He looked like a cross between an ant, an Elephant, and a space alien. 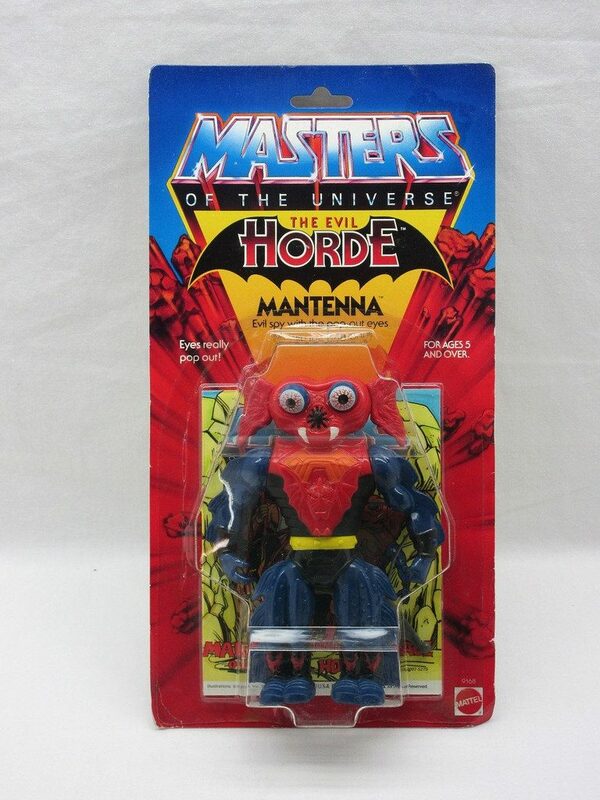 Designed by Ted Mayer, Mantenna is certainly the weirdest looking figure in the Masters of the Universe toyline. According to the Power and the Honor Foundation Catalog, Mantenna’s early working names were Sensor (also a working name for Zodac) and Raydor. 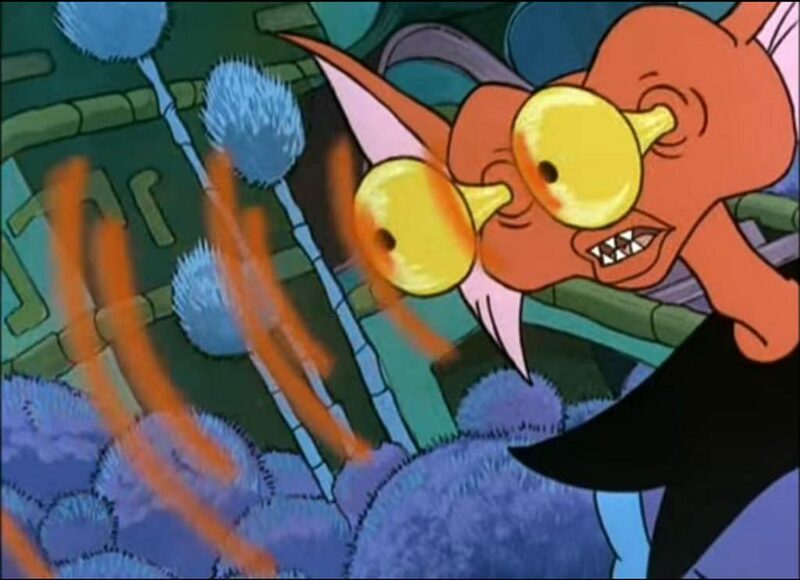 All of his names are puns on devices used to sense things from a distance – hence his large, pop-out eyes and oversized ears. 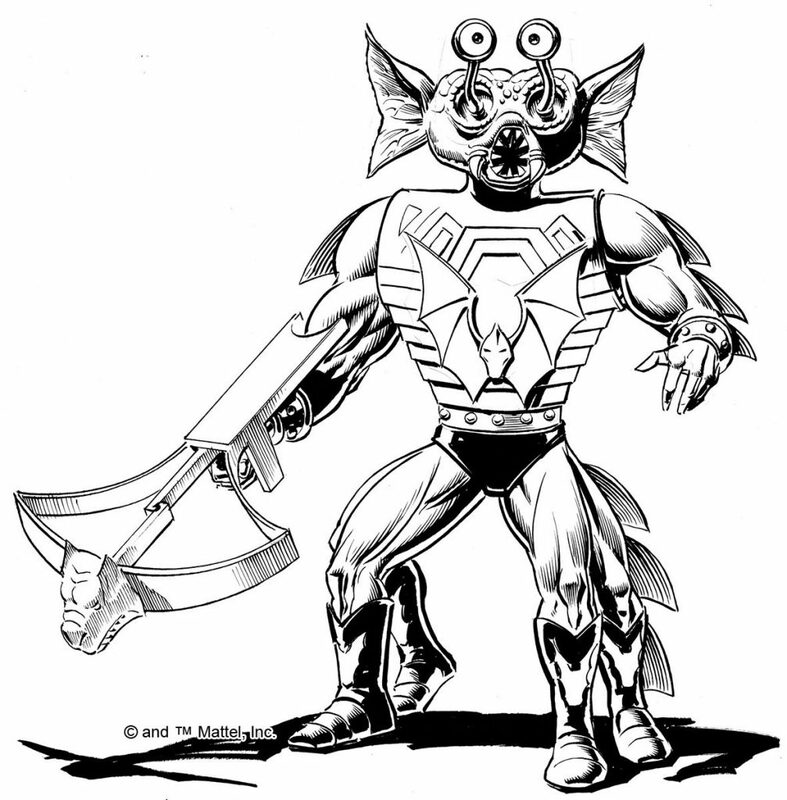 This early version of the character (below) has the early detachable horde insignia. He also has white teeth, red hands, and lacks the horde emblem shinguards he would get later in his design evolution. 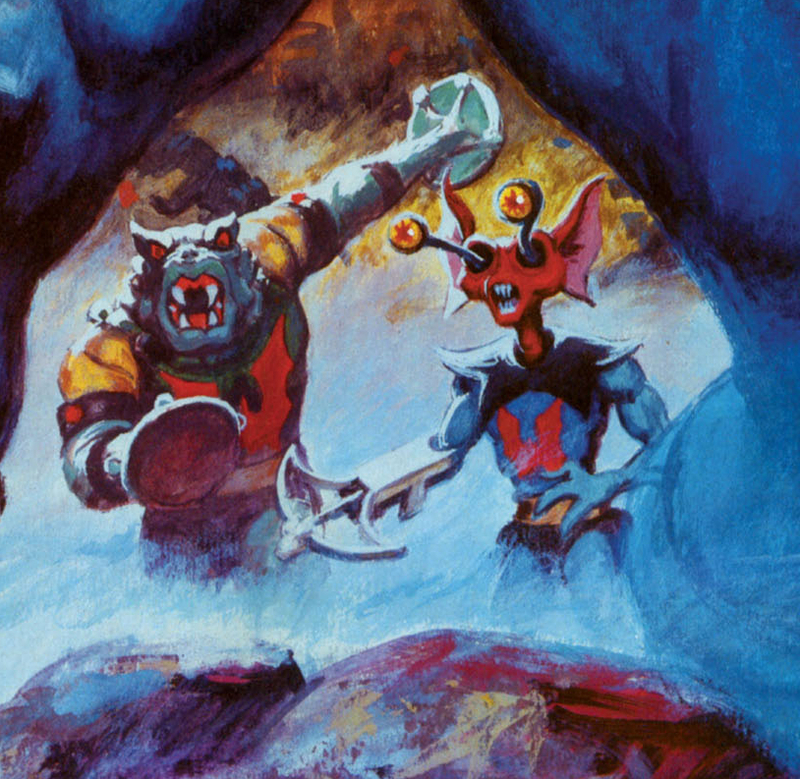 Image source: The Power and the Honor Foundation/The Art of He-Man. His eyes appear to have some kind of hypnotic power. This revised drawing by Ted Mayer gives the character red teeth, and the standard Horde insignia on his check, shin guards, and left arm. He was given a yellow belt and black trunks. He also had a strange staff weapon with some kind of creature wrapped around it. 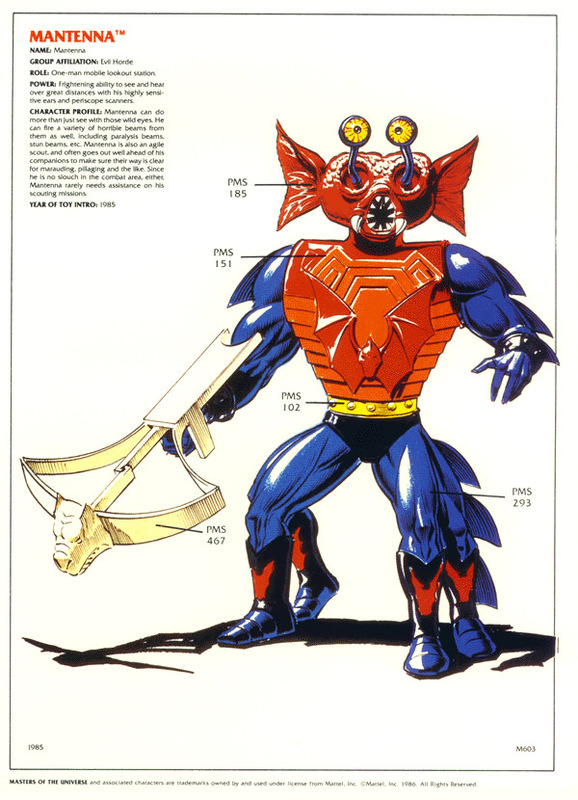 Hordak had a similar weapon in early concept art as well. 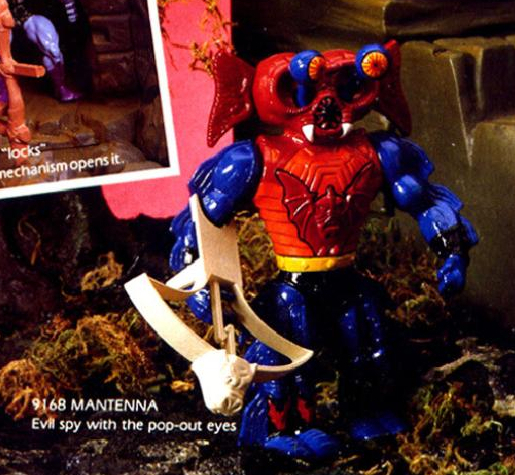 The prototype Mantenna is featured in the 1985 Mattel dealer catalog. The shape is finalized, but there are some color differences between this and the final toy. He has orange sides, rather than black. His chest insignia is outlined in black, as are his red teeth. His eyes seem to also have orange and red veins. 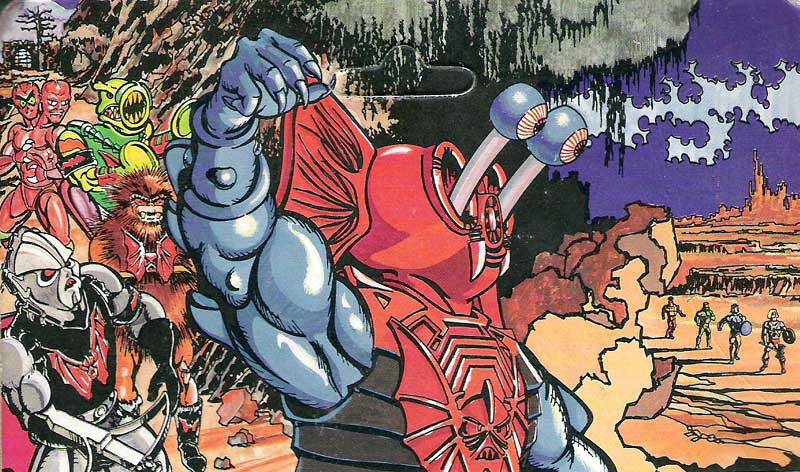 Mantenna’s cross sell artwork represents another intermediate step in his design – his sides are mostly black, there is still a strip of red or orange under his armpits. His teeth are also still outlined in black. The final Mantenna has fully black sides and simplified teeth. At this point it’s really not obvious that they’re actually teeth. It really looks much grosser than that. It’s not obvious at first, but the toy does retain the original concept of having four legs – but the legs were fused together in pairs. 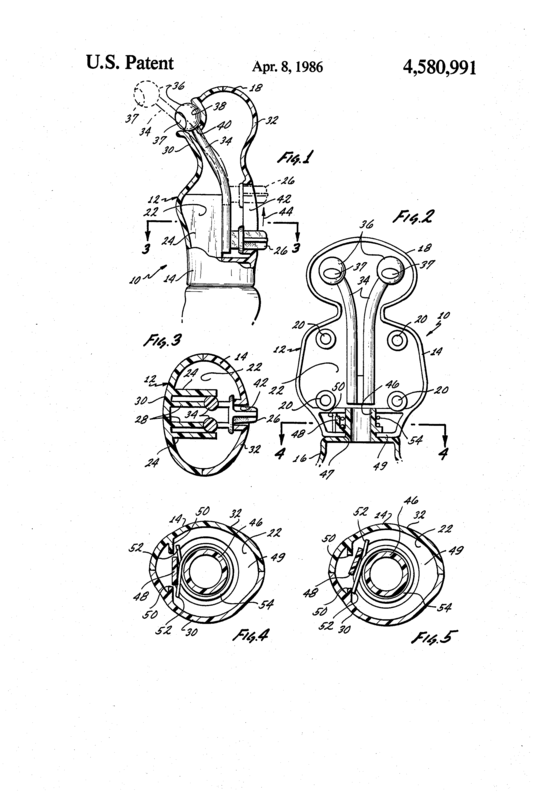 Mantenna’s pop-up eye mechanism was also patented, although it seems like a simple enough design. The patent was filed December 17, 1984, and it was trademarked on September 10, 1984. Mantenna was sold on his own single card, of course. He was also sold in a JCPenny giftset with Leech. Mantenna’s minicomic isn’t a fan favorite. 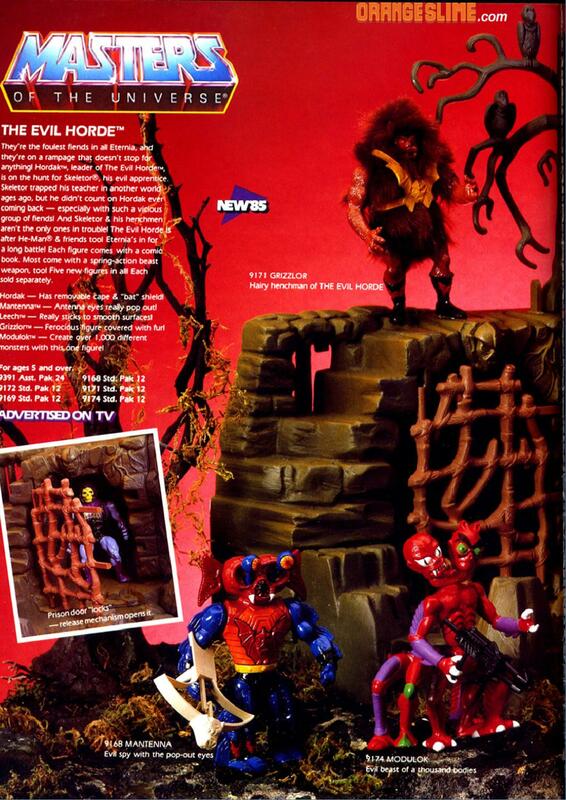 I remember not being able to get through it as a kid – the artwork seemed too jumbled and hastily done. 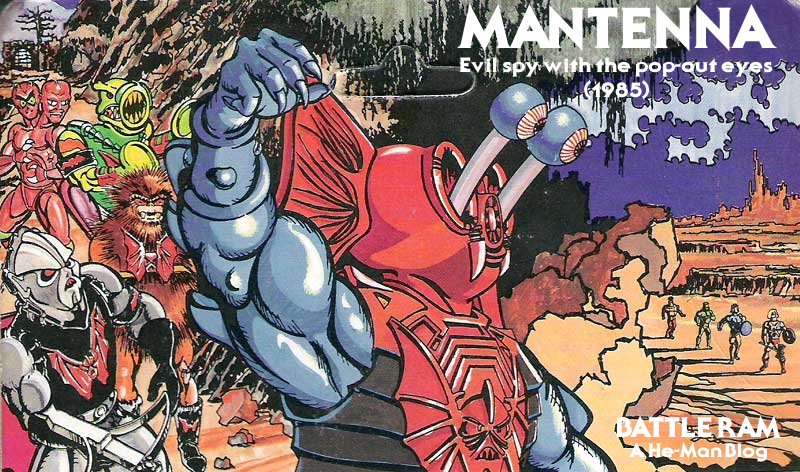 It should also be noted that although Mantenna’s name is in the title, he barely makes an appearance in it. Power: frightening ability to see and hear over great distances with his highly sensitive ears and periscope scanners. Character Profile: Mantenna can do more than just see with those wild eyes. He can fire a variety of horrible beams from them as well, including paralysis beams, stun beams, etc. Mantenna is also an agile scout and often goes out well ahead of his companions to make sure their way is clear for marauding, pillaging and the like. Since he is no slouch in the combat area, either, Mantenna rarely needs assistance on his scouting missions. 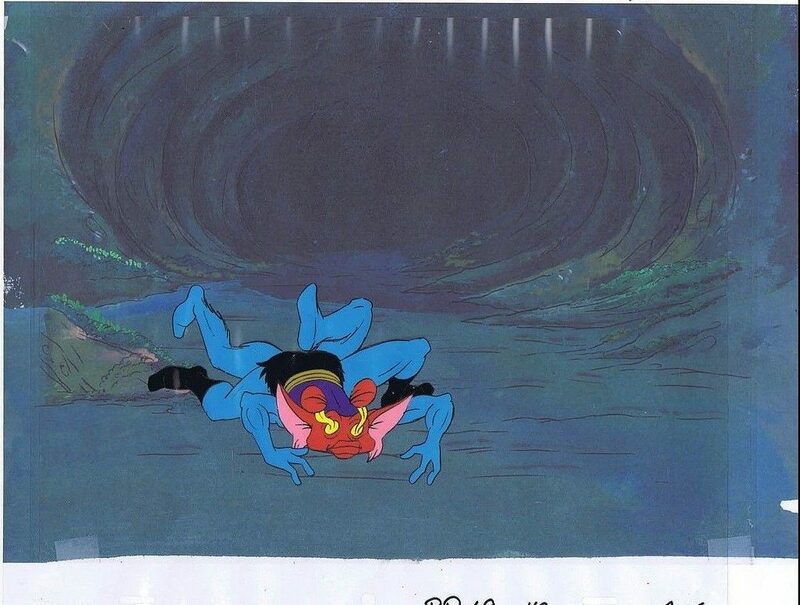 Mantenna’s grotesque appearance was toned down for the She-Ra cartoon series. 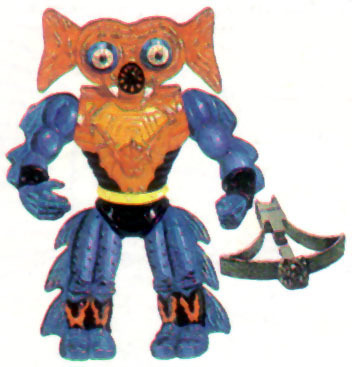 He lost most of the fins on his limbs, and his mouth lost its sphincter-like look. He was also given simple yellow eyes rather than the bloodshot eyes of his action figure. Changes were made to his hands, feet, and costume as well. 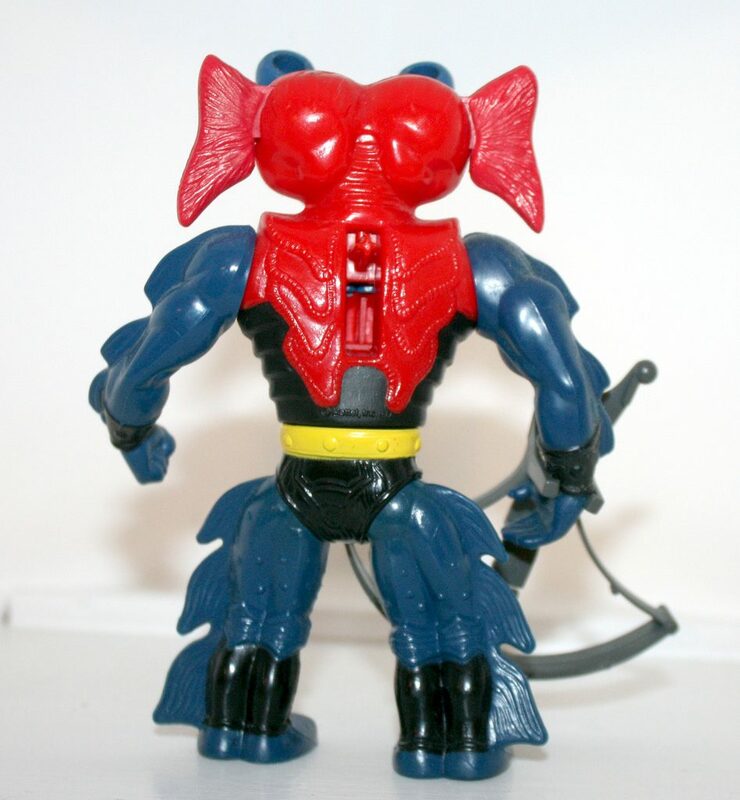 He was generally depicted a bumbling henchman, often dropped through a trap door by Hordak. Dusan M. pointed out that this is an intermediate design – final design sheets had a visible tongue. 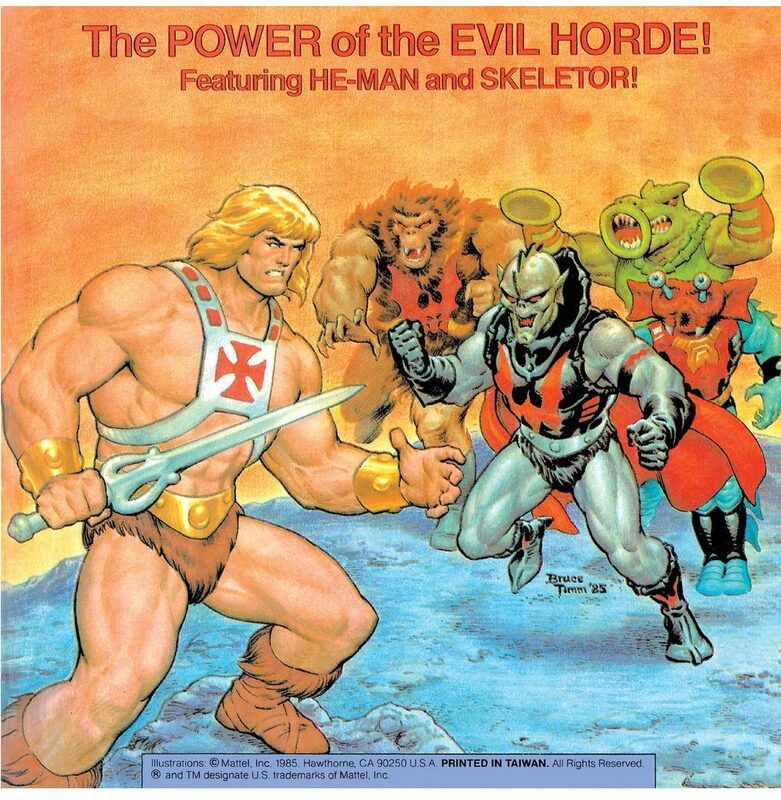 Mantenna maintains his Filmation look in this Evil Horde poster by Earl Norem. 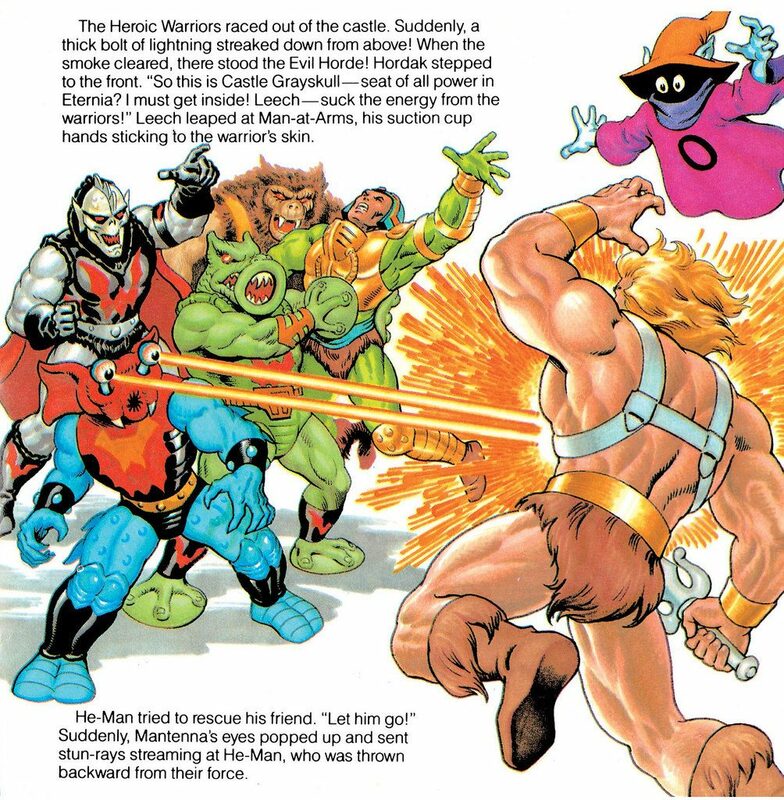 It appeared in the Summer 1985 issue of Masters of the Universe Magazine (US version). I have to say I’ve been really enjoying some of these entries. 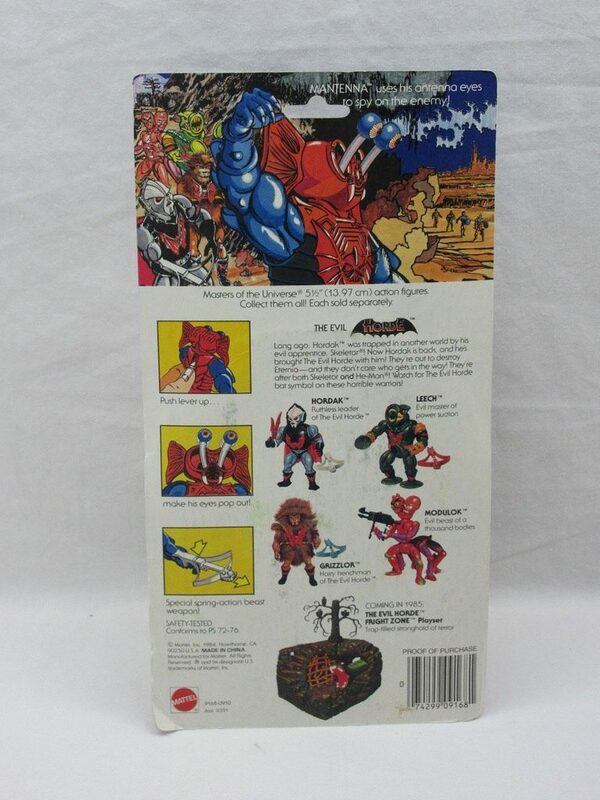 With all of the behind the scenes info you seem to find you should consider doing a book on this toy line the way Pat Contri did one on the NES library, or Tim Lapetino did with the Art of Atari. Great stuff! 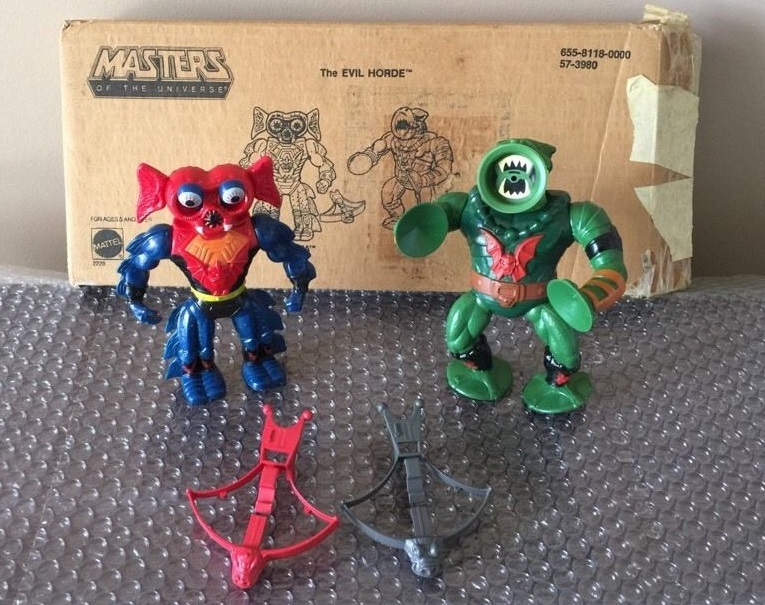 I’ve slowly rebuilt some of my childhood collection over the years picking up loose figures when I find them cheap. My Mantana’s eyes are all scratched up, but at least he has his crossbow! Thanks, glad you’re enjoying these! It would be complicated to put this into a book because of all the images and the various sources they come from. But it would be fun! Another excellent feature! Great stuff! Forgot to say that I got all the Horde at the same time and they became instant favourites. I’m STILL flip-flopping about which one is my favourite. OK…I’ll add one more thing. 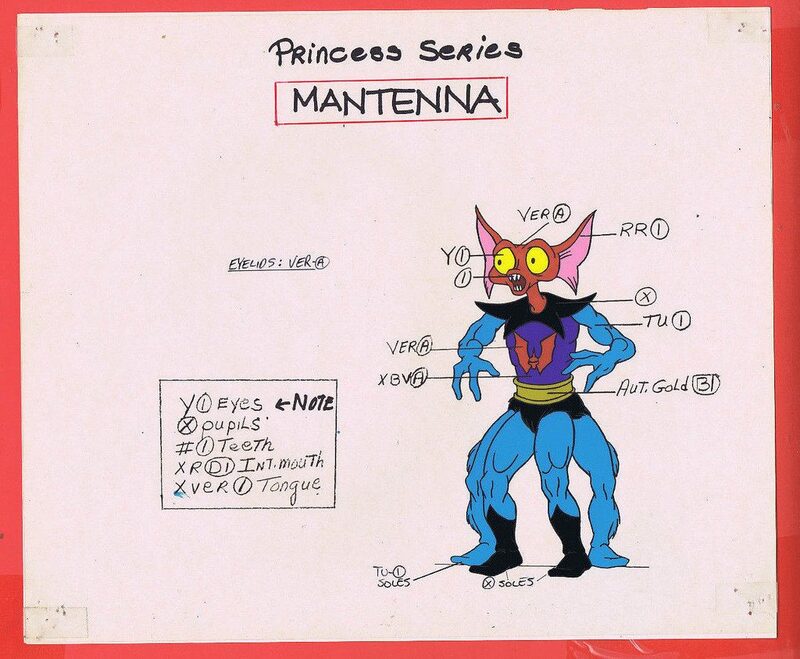 I hated the Horde character’s looks (like Mantenna) in the Princess of Power cartoon. Hated the designs then and I hate them today. 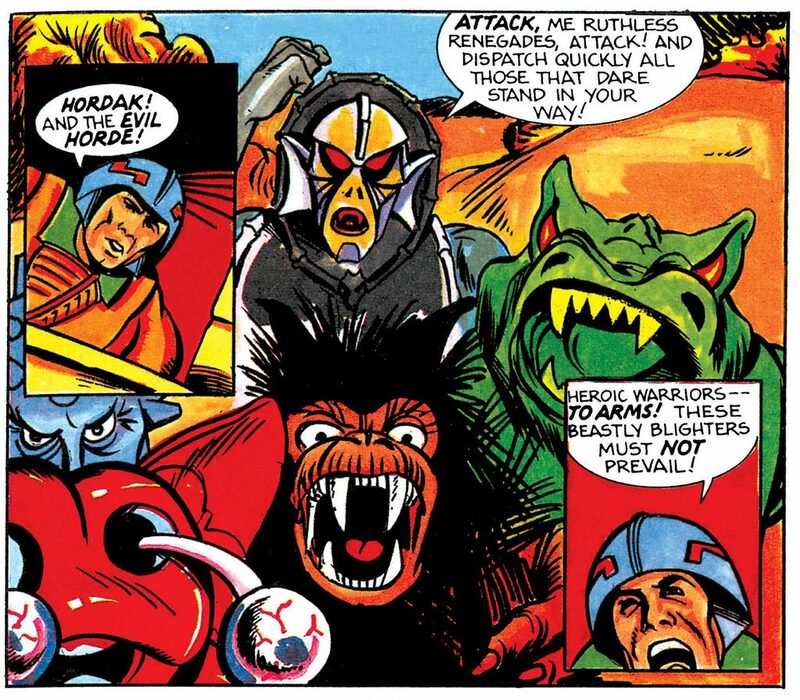 Only Hordak is bearable. They’re all a bit watered down, aren’t they? Absolutely. While the animated shows simplified all of the designs and sanitized things to make it all toddler-friendly, Mantenna is one of the characters who really got the worst of it. 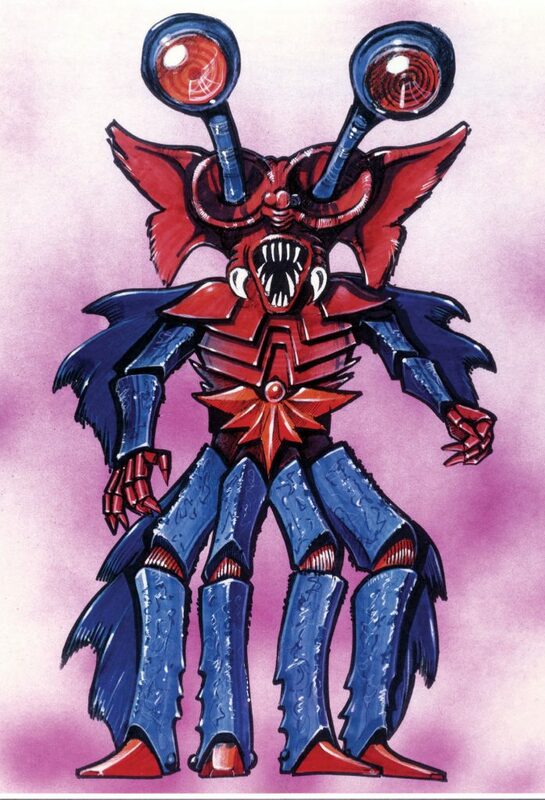 They took a supremely creepy design and threw away practically everything that was cool and interesting about it. I always thought he was meant to be extremely loosely based on a Manta ray.. but very loosely.. also thought it was stupid that while the main gimmick was his eyes pop-out for various things (to get a better look or maybe to activate some special power) that art and cartoons mostly showed his eyes always out.. kinda neutering the feature as an action feature.. 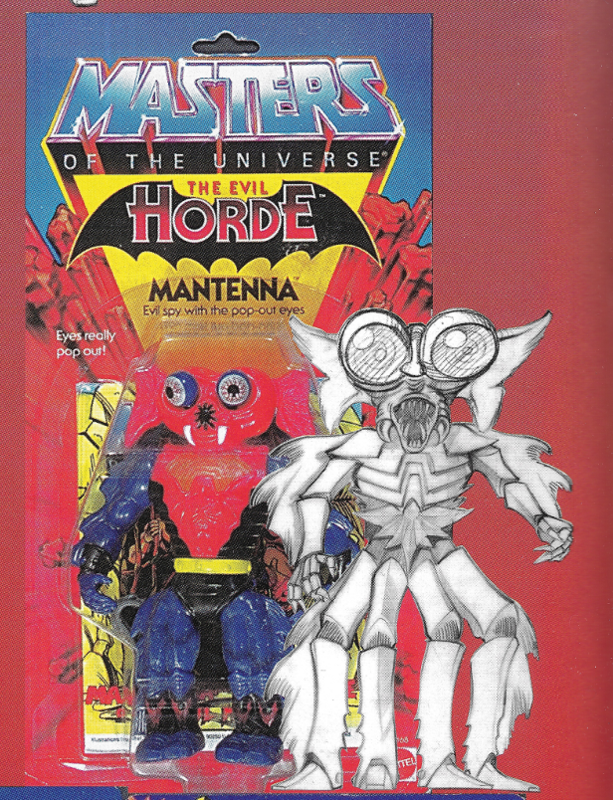 I always found it weird that Mantenna is supposedly a very skinny spindly character, in both the concept art and the POP cartoon, but his action figure is very bulky. 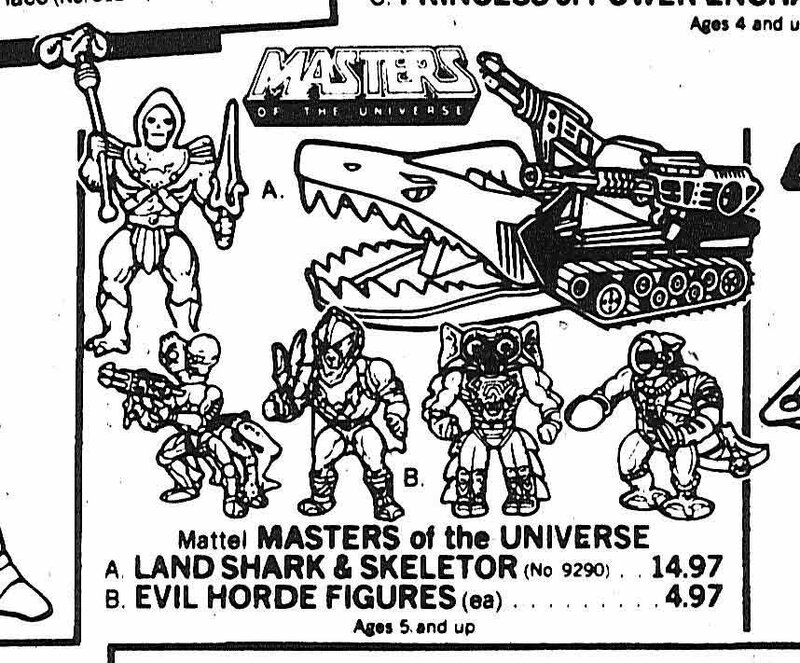 Mantenna… I had the toy as a boy; he was okay, though I was never a massive fan of the Horde (I was and always will be primarily a fan of those early barbarian He-Man vs. Skeletor days) and it kinda summed up the line becoming more gimmicky and anything goes for me. That said, I didn’t hate him, either. 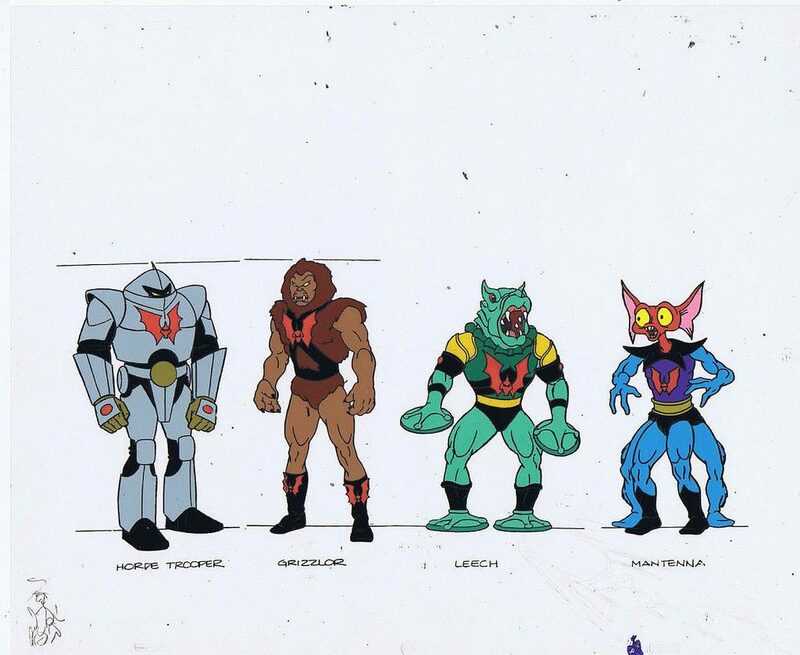 As I understand it, a very early concept for what would be developed into ‘The Evil Horde’ was that they were aliens attacking Eternia, mind-controlled by the bat insignia’s on their chest. 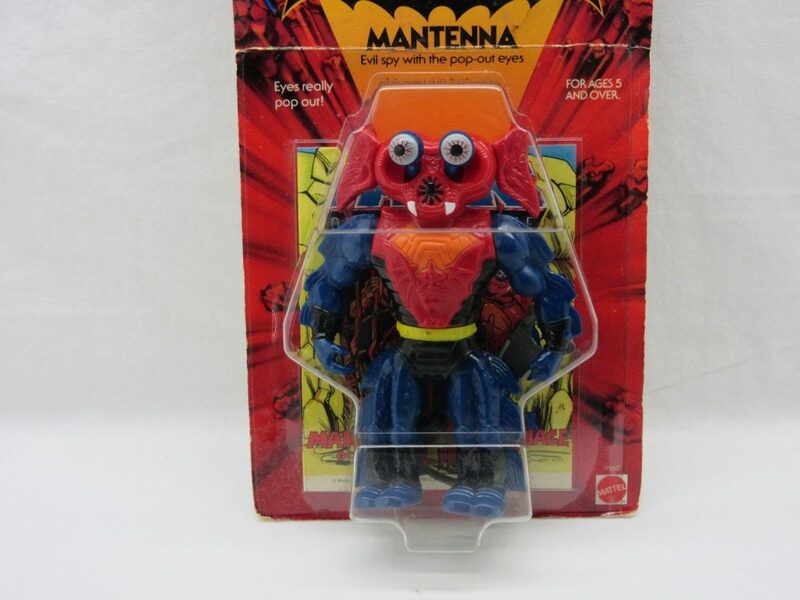 If this concept had ever been followed through, the Mantenna would certainly have looked the part as “bug eyed alien”, at least! 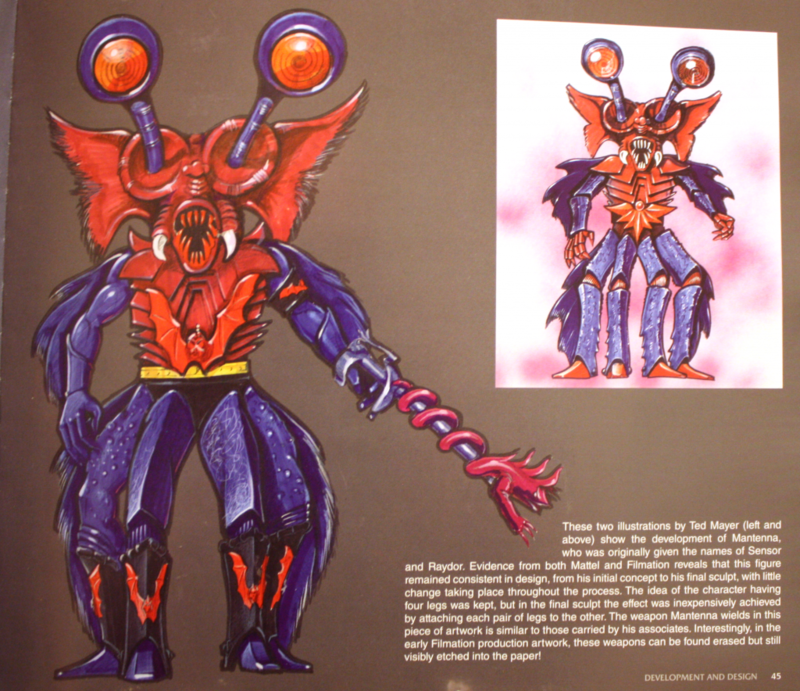 Surprised it hasn’t been pointed out yet (unless I missed it), but Ted Mayer’s concept art Mantenna’s weapon with creature spiraled around it (which concepts of Hordak also had), is very similar to what would go on to be used for many of the Snake Men’s weapons, the staff with the snake wrapped around it. The final Mantenna figure looked okay I guess… it lost points for the two legs joined together (it wasn’t for a year or so until I noticed what they’d done, mold the pairs together), and the mouth… I don’t think I ever realised it was supposed to be a mouth for some years, more like a nose… a spider like nose. The concept is okay, but I do feel the sculpting (and over-simplified paint job) did let this one down a bit. In fact I do sadly feel that the final paint job all over did let the figure down, seeming quite lazy and corner-cutting, and not making as much of the sculpt features as it might have done. During my years collecting a complete set of the line, I did know of the “unpainted boots” variant and eventually came across a copy. It did indeed have a different coloured level on the back too, though I don’t recall the paint job on the front armor being any different as the article suggests here. 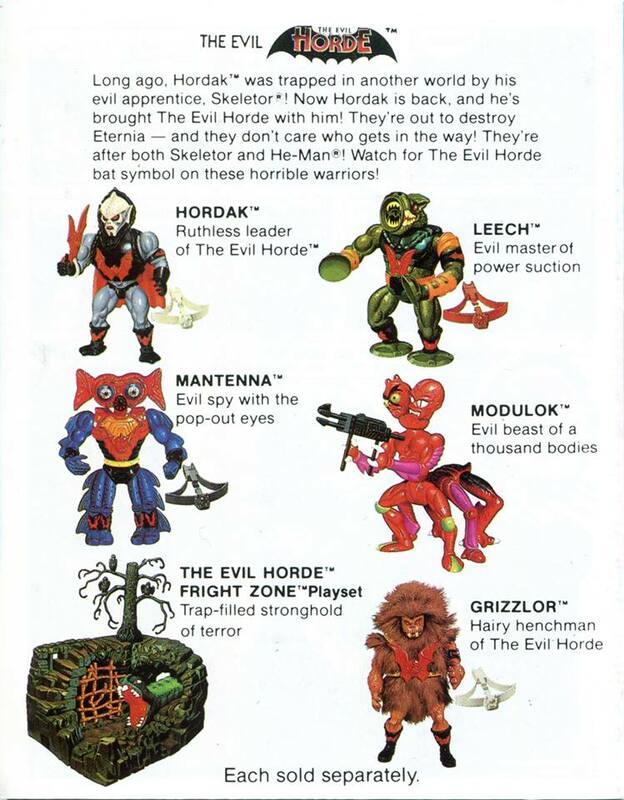 As for the ‘Mantenna and the Menace of the Evil Horde’, it generally ranks among my least-favourite of all the mini-comics. Many of the later mini-comics seemed very rushed, both in terms of artwork and general “story” (debatable if some actually had one!) in order to quickly promote/showcase the latest new figure(s); Mantenna’s particularly suffers for this. Horrific artwork, that looks rushed and scruffy (and inaccurate) that looks like it was done by a five year old (Mantenna looks like he has a mustache half the time! ), the plot is barely existent and what’s there isn’t that interesting… due respect to those involved, but one of the weakest mini-comics all round.